BIRF (Business Intelligence Reporting Framework) is a project developed for the European Space operation Center (ESA-ESOC), with the objective of creating an environment that makes easier for ESOC responsiblesto get an immediate view of the state of the projects which are been carried out by contractors. Software projects are difficult to manage. In complex environments, like the space programmes, this takes more importance, because they are large projects, involving complex subcontracting structures, and producing critical software. Project progress reporting is normally based on periodical generation of manual documentation, without following a homogeneous approach for all projects. This situation drives to a proliferation of data about different aspects of the projects, which are difficult to collect and to evaluate from a global point of view in the organisation, and which requires significant routine manual work. What it has been managed with BIRF is to unify the interface to communicate the progress of projects, gathering data about different aspects of it (progress, milestones, costs, risks, meetings, etc. ), evaluating and providing an integrated view of the projects status by using performance indicators (KPIs) adapted to diferent roles and levels of responsibility. 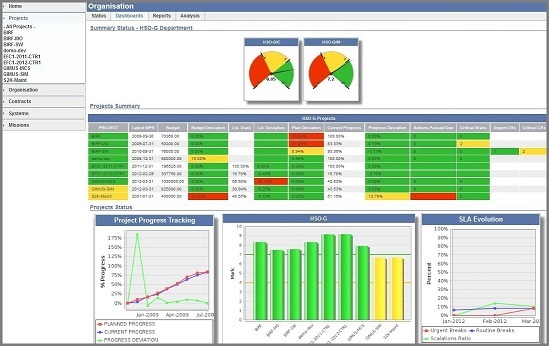 Improved control over software projects, formalising interfaces with contractors and providing an accurate evaluation of the status of processes and products for proactive management and better decision making. Improved productivity, automating time consuming routine tasks for data collection and reporting, as well as providing a quick access to all information related to the projects for all key actors, from technical officers to high managers. Contribution to improve organisational processes, through the standardisation of best practices and the support to continuous improvement based on measures and evaluation of objectives. Large organisations externalising projects or services, to improve control over subcontractors. Software companies, optimising their resources, and facilitating the adoption of mature processes (e.g. CMMi). Other areas of space missions, where it is neccesary to evaluate the performance of a complex environment, such as non-software projects, operational systems, etc.